WHY SHOULD YOU PAY ATTENTION TO CHRONIC INFLAMMATION? Chronic inflammation is linked to chronic conditions as diverse as cancer, Alzheimer’s, obesity, congestive heart failure, and diabetes. “Silent inflammation” is literally a stealth bomber, reducing your odds of living a long and disease free life just as effectively (and as silently) as if you were breathing an invisible, odorless poison gas. If you’ve ever stubbed your toe, banged your head against a beam, or gotten a splinter or abscess, you know what acute inflammation is. White blood cells – also known as leukocytes – mobilize to the injury site, surrounding it like an army blocking off any invading force. Specialized white blood cells called macrophages (Latin for “big eaters”) look and act like little PacMen, initiating defense mechanisms and literally swallowing up and immobilizing any invading pathogens. These activities are collectively known as “inflammation.” Our bodies need these inflammatory chemicals, because the ability to mobilize them effectively is an integral part of the natural healing immune response. These inflammatory cells keep little infections from becoming big ones and spreading throughout your body. But in the last decade, for an awful lot of people, the inflammatory army is in complete overdrive while the anti-inflammatory army is underfunded. People need inflammation to heal – it’s vital to have those white blood cells rushing to the site of an injury; however, the body also needs anti-inflammatory compounds to act as correctives when there’s too much inflammation. Inflammation and anti-inflammation forces need to be in balance, otherwise there’s trouble. “Classic (acute) inflammation hurts,” says Barry Sears, PhD. “Silent (chronic) inflammation slowly kills.” In the latter case, instead of being a transient event, the inflammatory response persists over time, “like an ornery child who can’t resist picking a scab” writes science reporter Christine Gorman. Eventually, chronic inflammation can and will destroy tissue. Some foods, like sugar and excess vegetable oils, and allergens, have the effect of turbo-charging the inflammatory production pathways, while other foods like wild salmon with its rich content of omega-3s, and the antioxidants have precisely the opposite effect. This is where things get interesting from a clinical prospective. The body makes inflammatory and anti-inflammatory compounds called eicosanoids from one source only: fat. The type of fat one consumes has a profound factory. Omega – 6 fatty acids, the kind found in vegetable oils like corn, safflower, soybean, and canola oil are pro-inflammatory – they’re the precursors for the inflammatory chemicals manufactured in the body. But, Omega 3 – fatty acids found in fish, fish oil, flaxseed, chia seed, and hempseed are the exact opposite. They’re precursors for the body’s anti-inflammatory compounds. Most researchers agree that the ideal relationship of omega – 6 fatty acids to omega – 3 fatty acids is about 1 – to – 1, the same ratio found in the diet of hunter-gatherer societies. This ratio keeps the eicosanoid production factories in harmony, with the body producing a nice balance of inflammatory and inti- inflammatory chemicals as needed. Unfortunately, the ratio of pro-inflammatory fats to anti-inflammatory fats in the typical American diet is far from ideal. It’s usually between 15 or 20 : 1. The plant kingdom is loaded with natural anti-inflammatories. (One example is quercetin, found in onions and apples.) Some of the anti-inflammatory superstars that should be part of any anti-inflammatory diet are the following: Onions, Garlic, Leaks, Leafy greens (spinach, chard, and kale), Tomatoes, Bell peppers, Brassica vegetables (brussel sprouts, cabbage, broccoli, and cauliflower, Beans (all types), Spices (ginger, turmeric, cinnamon, cloves), Flaxseed and Flax Oil, Tea (all), Red Wine Cocoa and Chocolate (low in sugar), Nuts and Seeds, Herbs (parsley, rosemary, thyme, oregano, mint, tarragon, dill). Alos, wild salmon, which isn’t a member of the plant kingdom but is a good great source of omega-3’s found in food, as well as the superstar antioxidant astaxanthin. Grass fed beef also has omega-3 fats, as do sardines, mackerel, herring, and tuna. Many supplements can help lower inflammation. Here is a short guide to the most important ones. Omega – 3. Omega-3s are among the most anti-inflammatory substances known and should be part of everyone’s supplement program. Given the variety available in the market, it’s clear that most consumers are sold on them. Omega – 7. Omega – 7 is a fatty acid found in cold water fish as well as macadamia nuts and sea buckthorn berries. It has beneficial effects on metabolic syndrome, diabetes, weight, triglycerides, and insulin resistance. A study at the Cleveland Clinic found that omega-7s lower C-reactive protein – a marker for systemic inflammation – by 44 percent. Curcumin. This extract from the Indian spice turmeric has multiple benefits and is highly anti-inflammatory, while being easy to supplement. Research has demonstrated its anti – inflammatory, anti- oxidant, anti-thrombotic, and cardiovascular protective effects. It also reduces oxidized LDL (bad) cholesterol. Resveratrol. Resveratrol is the ingredient in Red Wine that’s best known for its anti-aging properties. It helps protect the arteries improves their elasticity, inhibits blood clots, and lowers both oxidized LDL and blood pressure. It’s both a strong antioxidant and anti-inflammatory, inhibiting a number of inflammatory enzymes that can contribute heart disease. The recommended does is 200 mg a day of trans-resveratrol, the active component of resveratrol. Methyl sulfonyl-methane (MSM). This is a natural anti-inflammatory that blocks the transmission of pain signals in nerve fibers. It’s known for being great for joint health and reducing the pain of arthritis. The biochemical precursor to MSM – dimethyl – sulfoxide – has been studies extensively for pain and inflammation. Cocoa flavanols. Plant chemicals in cocoa known as flavanols help the body synthesize nitric oxide, which is critical for healthy blood flow and blood pressure. Nitric oxide also makes the lining of the arteries less attractive for white blood cell attachment. Researchers in Germany found that those who ate the greatest amount flavanol-rich dark chocolate had lower blood pressure and a nearly 40 percent risk of heart attack or stroke compared to those who ate little or no chocolate. Boswellia. Boswellia is well known for its ability to lower inflammation. A does of 150 mg three times a day is recommended for two or three months. It has been used effectively in combination with ginger, turmeric, and ashwaganda, and proven beneficial for inflammation and pain associated with osteoarthritis and rheumatoid arthritis. Gamma-linolenic acid (GLA). This is an anti-inflammatory omega-6 fatty acid and the active ingredient in evening primrose oil, borage oil, and black currant oil. GLA seems to have a synergistic effect with the long-chain fatty acid EPA (eicosapentaenoic acid) and should be given together with omega-3 fish oil. About 1000 mg a day of GLA is recommended. Now, I know, that after reading this, you’re thinking, ”How will I get all of these anti-inflammatory nutrients into my diet”? It’s my job to know how to get that done and to make it as simple as possible for you. I can sit down with you and review your dietary intake and make substitution recommendations, and I carry several supplement lines that make compounds which combine many of the ingredients listed. 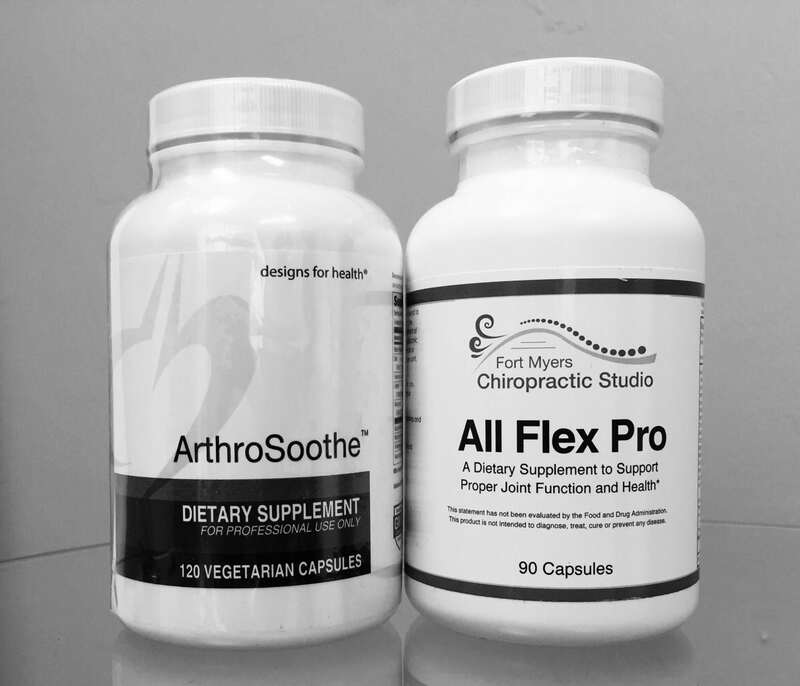 For example, our All Flex Pro contains a blend of non-dairy probiotics, Vit C, Vit E, Zinc, Copper, Glucosamine, Bromelain, MSM, collagen, GLAs, Boswellia, and proteolytic enzymes all of which help to reduce inflammation. Another product, Arthrosoothe, combines many of these ingredients with curcumin. It may not be possible to get everything you need in one formula, but at least I can help reduce the field and make meal time and taking your supplements as simple as possible. As hard as it may seem, I can help you simply and in the end it will all be worth it. Remember, lowering inflammation may be one of the most important things you can do for your overall health. ⟵Nutritional Supplements: The BIG 3 that I feel are a must!